I was visiting Con Vanh as a promise to a friend who had assured me that a short break on the islet was just what I needed after a particularly stressful time at work. I was persuaded that not only would my mood be lightened, but that the pure sea air and untouched beauty of the place would restore me to health and soothe my jaded nerves. As I looked about my dingy room in the guesthouse where I was staying, I regretted my decision to come. Romance for lovers: Purple-pink sunset of autumn on the islet. Feeling claustrophobic in my tiny cell – yes, there were security bars on the sole window – I decided to take a stroll along the beach, but I was unmoved by even the purple-pink sunset of autumn – a time of year I love. And neither was my anxiety eased by the deserted expanse of sand before me: instead of unspoilt loveliness I saw only neglect. My surroundings induced something close to loathing, and I longed to return home to Ha Noi. We walked and walked along the beach, our bare feet leaving footprints in the sand. Fringing the beach, rows of pine trees swayed lazily in the cool evening breeze, while the sea lapped the shore. 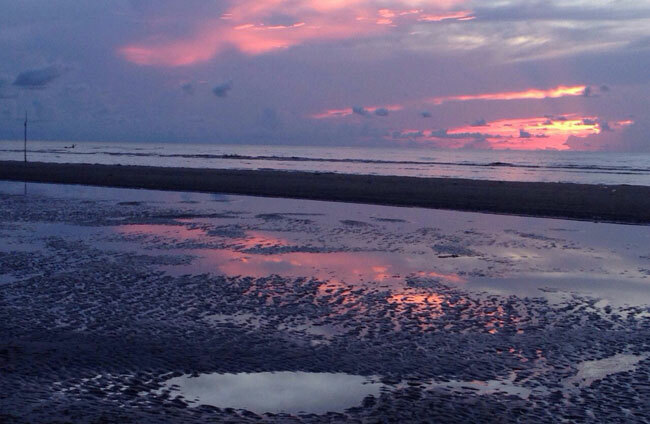 In the half-light, I studied the nearby sand dunes – the daughters of the sea and the sky. The night sky twinkled beguilingly. Out at sea, on waves that stretched out and rose, fishing vessels swayed in rhythmic repose. We walked past a young couple who were listening to music on a smart phone, their heads cocked to no doubt better hear the lyrics to an ode to the sea, while the magnesium white light of the moon danced on the ripples of the sand and the sea. And I was happy. 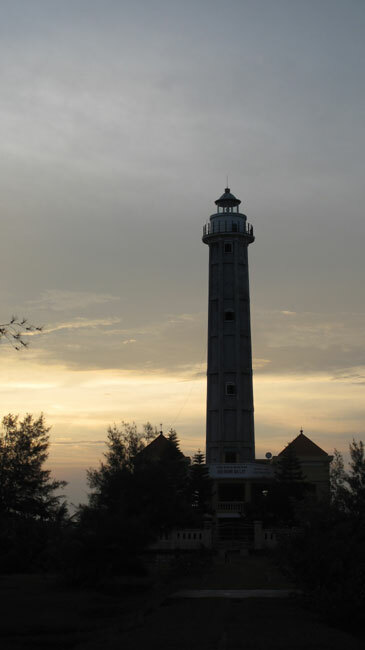 Beakon: Ba Lat Lighthouse, the best place to admire untouched beauty of the islet. We woke up early the next morning and I was eager to explore Con Vanh, which nestles in the Gulf of Tonkin, in Nam Phu Commune in Thai Binh Province's Tien Hai District, about 140km from Ha Noi, close to Cat Ba Island in Ha Long Bay. The islet is in the alluvial plane of the Hong (Red) River and occupies a total area of 1,696ha. Its beach is seven kilometres long. It forms part of the Red River Delta Biosphere Reserve that was recognised by UNESCO in 2004, and boasts 700ha of mangrove forest and 56ha of casuarinas evergreens. 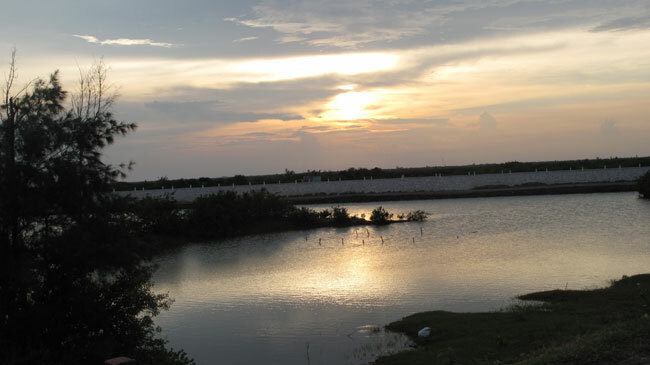 It also has a diverse salt-march ecosystem that is home to over 200 species of marine animals and several rare birds. Coming together: A view from Ba Lat river mouth, where the Red River flows into the coastal waters of Nam Dinh and Thai Binh. Although once only accessible by boat, the islet is now connected to the mainland by a seven-kilometre cement road that is lined with pine trees. "I was the first person to come and settle here, where I've been since 2005," said Nguyen Van Mien, the owner of the 20-room Hoa Mien Guesthouse, the biggest on Con Vanh. "Con Vanh is attracting more and more tourists, even foreign visitors, in all four seasons," he adds. To the south of the long sandbar that is the islet of Con Vanh is Ba Lat Lighthouse, which is where we are now standing and admiring the view of the Ba Lat river mouth – where the Red River flows into the coastal waters of Nam Dinh and Thai Binh. 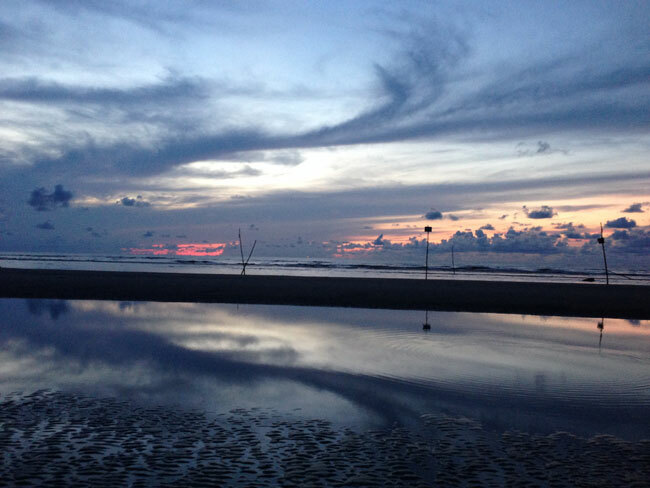 Hoang Chien Thang, who is visiting Con Vanh for the second time, loves the untouched beauty of the islet. "It's an idyllic place for a picnic. I think it's also a place for lovers. It is blessed with seven kilometres of untouched sand, gentle slopes, calm water, pure air, a good climate – ideal for relaxation and convalescence. "Though it is not the best beach in the country, to me it's a very special and romantic place," Thang said. At dawn, fishing boats return to shore laden with crabs, bass, tuna, prawns, cuttlefish and be be (stomatopods or mantis shrimp, a kind of marine crustacean that is especially delicious if it has roe). You can buy seafood directly from the fishing boats, which the locals will gladly prepare and cook for you while you enjoy the sea air. Delta biosphere: Con Vanh has a diverse salt-march eco-system that is home to over 200 species of marine animals and rare birds. Aside from sunbathing on the beach, visitors can barbecue food, camp or even windsurf. Those keen to take in the sights, should visit Con Den beach in Thai Thuy District, Dong Chau beach (7km away) and other landmarks such as Keo Pagoda, Mau Doi and Tien La temples, the Tran Dynasty historical complex, Minh Lang Embroidery Village, Dong Xam Silver Engraving Village and Bach Thuan Garden.